January 22, 2017. Just a (fairly) short post today. Matthew and I have been inundated with work for months, so I haven’t had much time to write. Now that Easter’s almost here, I’m desperately trying to catch up before we take our first big travel excursion since Christmas. We’re heading to the island of Malta in less than a week! But I’m getting way ahead of myself, and my story of Louis Armstrong in Norway. Winter turns the forest into a crystalline sculpture garden. One Sunday afternoon in mid-January, Matthew and I played hookey from work in order to hike the path to our favorite log cabin-ish café, Ullevålseter. The winter had thus far been warm and virtually snowless — in other words, kind of a bummer for those of us who like to cross-country ski. However, a thin layer of white stuff had fallen the night before … just enough to wrap the trees in woolly blankets and help amplify the watery sunlight that barely graces the sky this time of year. 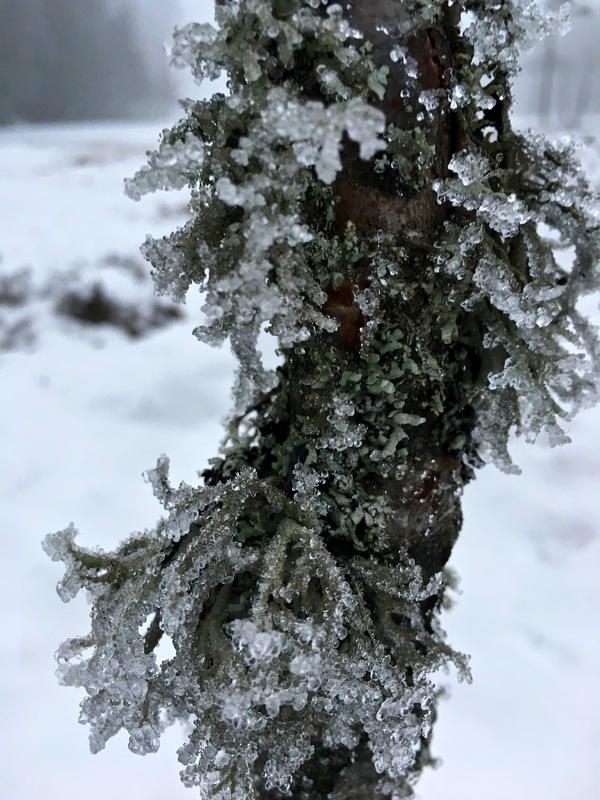 Check out the hoary frost on this lichen-covered sapling. We soon nixed the idea of skiing, however, as the snow wasn’t really deep enough. But we thought it might be possible to trek into the woods, if we used our ski poles as hiking sticks and strapped on some crampons to handle the slick spots. 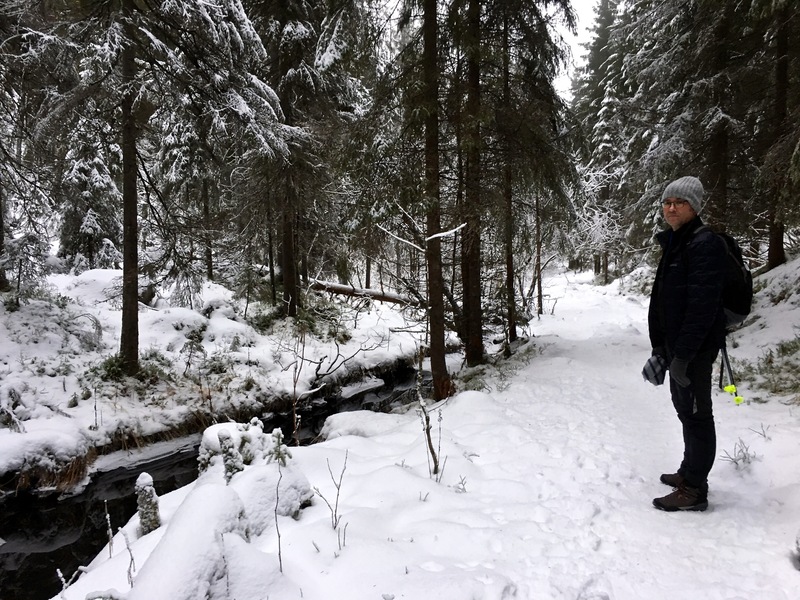 Good thinking, because when we arrived at the Sognsvann Lake trailhead, it was to discover that the passage of many feet had created a virtually impenetrable layer of ice. 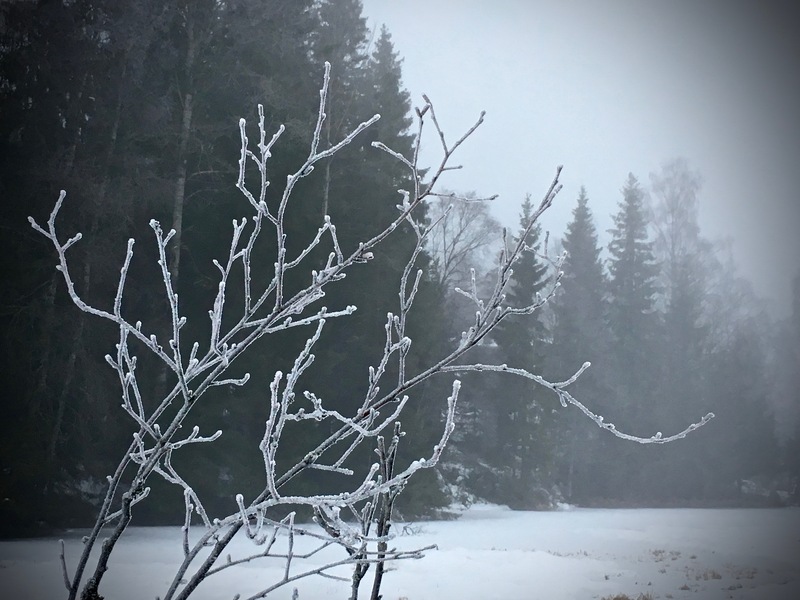 The trees themselves sported a dense coating of what appeared to be freezer frost, the ice crystals so thick that a chisel would surely be needed to locate bark. These three tykes devoted some serious concentration to mastering the skills of maneuvering the puck towards a pile of muck they’d crafted as their goalpost. Check out the number of folks treading defiantly over the dubiously frozen surface of Sognsvann Lake. The ice makes primo picnicking destinations like the little island near shore much more easily reachable. 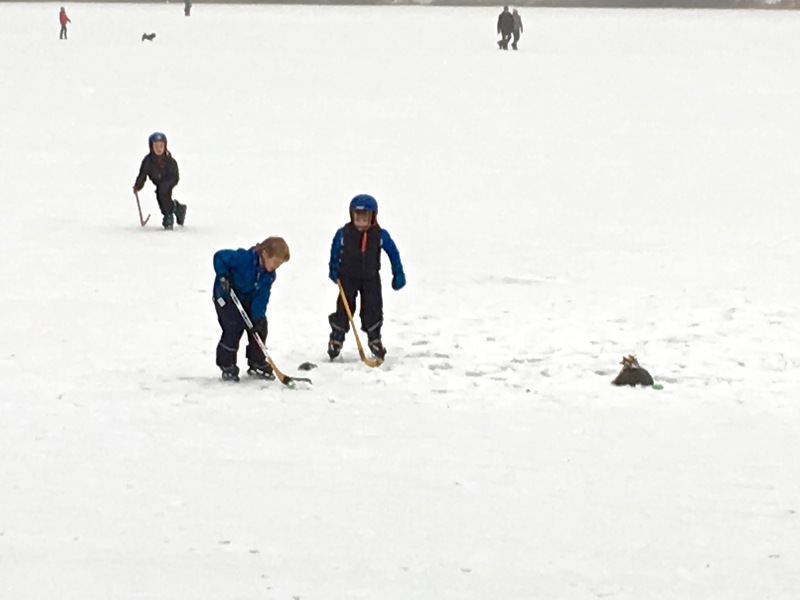 Note that these avid players have brushed away the snow for a smoother hockey-rink surface. Their snow boots act as goal posts at either end. It’s just not Sunday if you don’t don your snowsuit, build a campfire, and roast hotdogs in the frigid outdoors. Matthew stands along one of the wider paths marked both blue and red for hikers and skiers. We chose a different route this time to reach Ullevålseter. 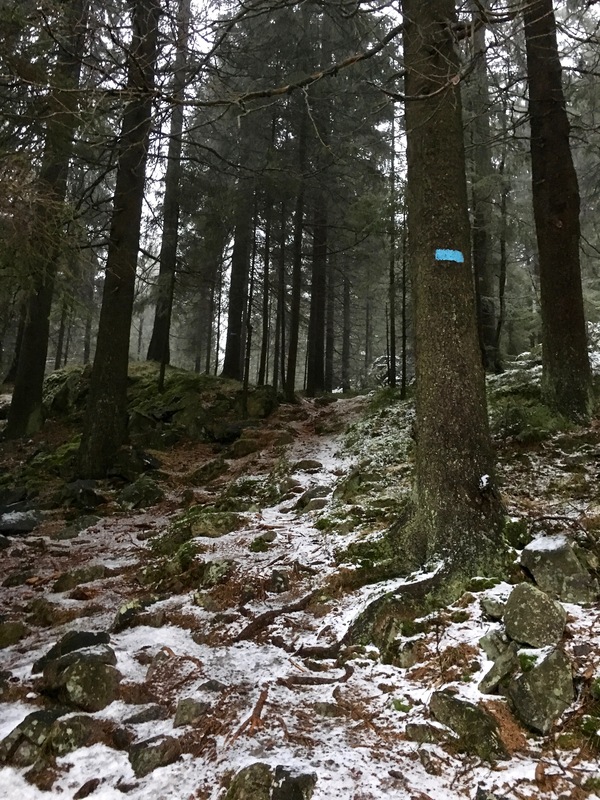 Rather than following the wider “red paths” — winter skiing trails typically clogged with traffic — we opted for the road less traveled; the “blue path,” intended for hikers only. These narrow tracks can grow so tangled and rough that they sometimes seem fit only for moose, deer, and dogs. Four feet rather than two are a distinct advantage when negotiating a rut strewn with gnarled roots and football-sized stones. Note the blue stripe indicating a footpath for hikers. I think “hoof path” might be a more appropriate term, considering the rough terrain seems more appropriate for goats. We’d hoped the snow might even out the lumps and make the trail a bit more passable, but no such luck. The thick tree cover had protected the forest floor from the worst of winter’s kiss. Some naked spots appeared devoid of frost entirely but proved treacherously slick with invisible black ice. Others sections of the path seemed oddly squishy and soft, especially considering the season. The boggy texture of the landscape almost fooled me into thinking that spring had arrived early. In places, snowmelt from higher elevations had trickled down and formed fantastic, partially frozen formations that reminded me of Mammoth Springs in Yellowstone. Where these ice flows merged with the path, our cleats and ski poles were the only thing that enabled us to remain upright and avoid a painful bum-dusting. For those of you who’ve been to Yellowstone, doesn’t this look a little bit like the limestone formation of Mammoth Hot Springs? I loved the patterns formed in the melting ice as a creek flowing beneath made its way down the hillside. Kinda looks like a hot springs, right? It’s not. I checked. And almost froze my fingertips. 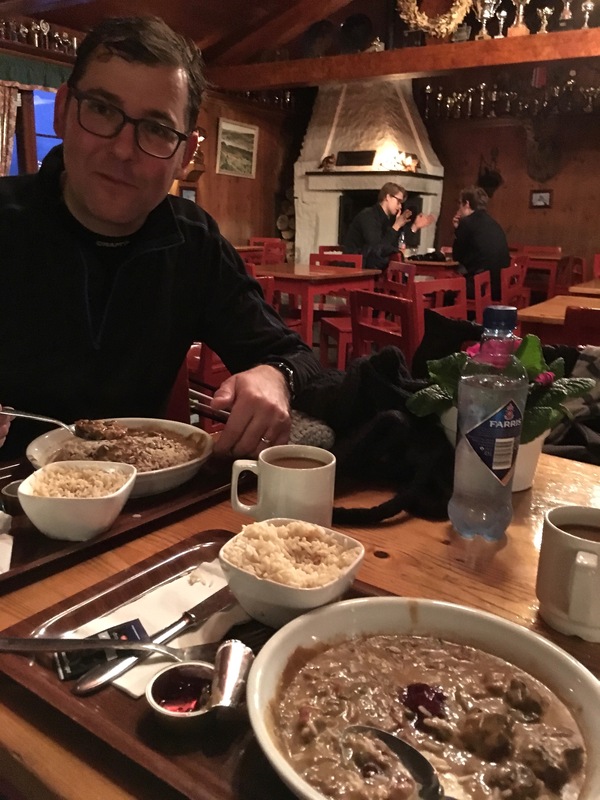 Yum — venison stew with lingonberry sauce! We made it to Ullevålseter just as the light of sunset faded. After tucking into a bowl of hjortgryte (deer stew), we roamed around inspecting new bits of ephemera that had been tacked to the walls since our last visit. Someone had tattooed a whiteboard with incredibly detailed cartoons that illustrated the history of the place. Through these drawings, we learned that Ullevålseter has a long history, starting with its inception as a summer pasture for cattle. In the 1700s, it became a large permanent farm covering an expanse of more than 4,000 acres. And centuries later, it morphed into a café (complete with a ski jump) that has been operated by the same family since 1927. Check out the amazing details that the artist has captured showing the place as it looks today. It’s a real folk-art masterpiece! Other text nearby explains that Ullevålseter started off as a summer pasture but became a small holding with permanent residents in 1737. Later, it grew into a 4,123-acre farm with oats and potatoes as the main crops, along with herds of milk cows and sheep, as well as a brood of hens. The cute drawing at the top left talks about the owner, Otto Reidar Ullevålseter, and the floodlit ski trails and ski jump his family built. He started ski jumping at age six and competed in many championships. The cartoon copies his pose from a photo of his longest jump ever — 310 feet, or 99 meters — done in 1954 in Washington State. The bottom drawing tells of his son, Pål Anders, who became the 2004 World Champion Cross-Country motorcyclist. 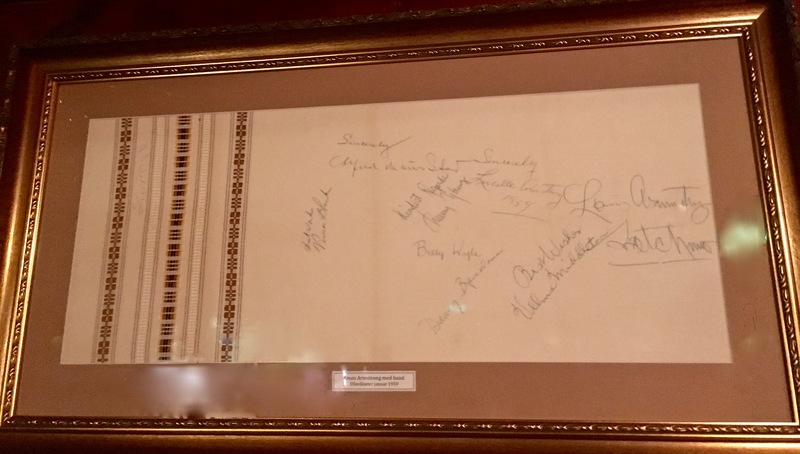 Note the autographs of Louis “Satchmo” Armstrong and his band, who apparently signed a table cloth during their visit. Nearby, we ogled familiar photos and autographs that clearly testified to a visit paid by Louis Armstrong in 1959. I judged that, since the afternoon crowd had cleared out, now was as good a time as any to become rudely nosy … so I started questioning the kitchen staff about Satchmo’s visit. The girl behind the counter said, “The owner who hosted him is here right now. Would you like to talk to her?” Of course I said yes, and soon a smiling older lady in an apron and Norwegian ski sweater popped out of the back room to greet us. 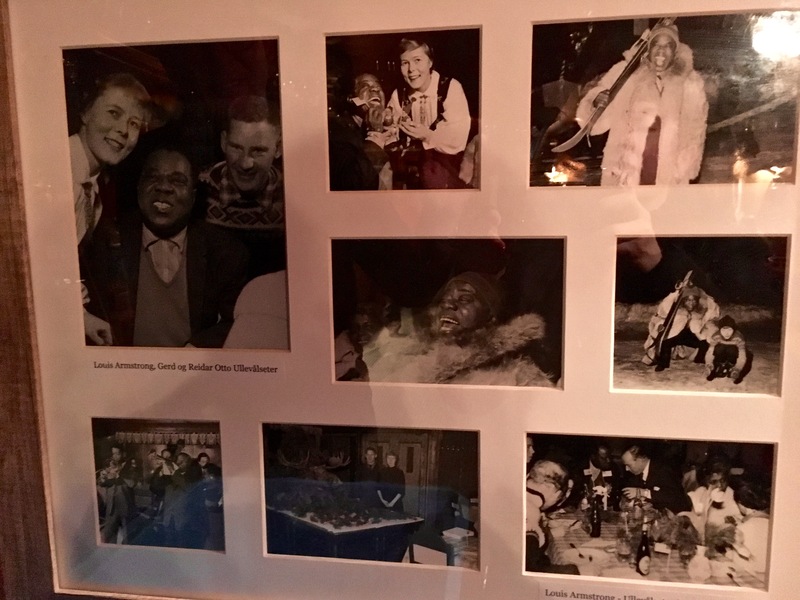 A photo collage of Satchmo’s visit hangs pride-of-place along the wall. I recognized her from the photos on the wall as she introduced herself as Gerd Ullevålseter. Then she went on to tell her story…. Pictured are Gerd, Satchmo, and Gerd’s husband, Reidar Otto Ullevålseter. Satchmo seems to have taken a fancy to Gerd’s dolls dressed in Norwegian traditional costumes. It looks like he’s even gifting them with an American flag. 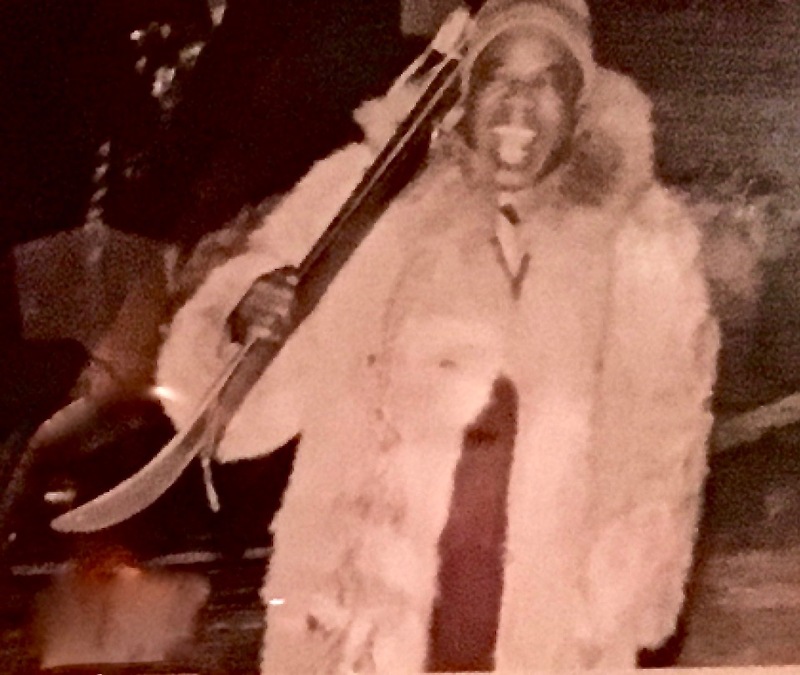 Satchmo poses with one of the littlest skiers. 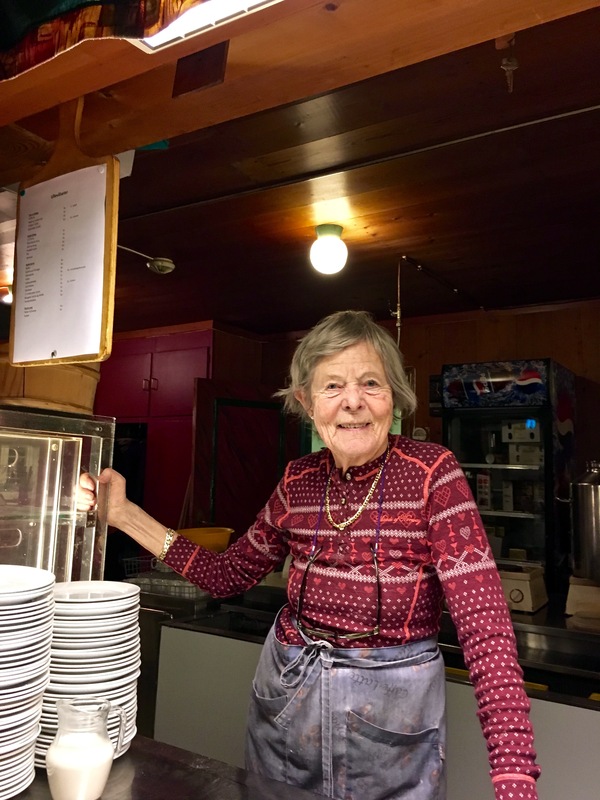 Gerd Ullevålseter today, at the counter of her historic café. 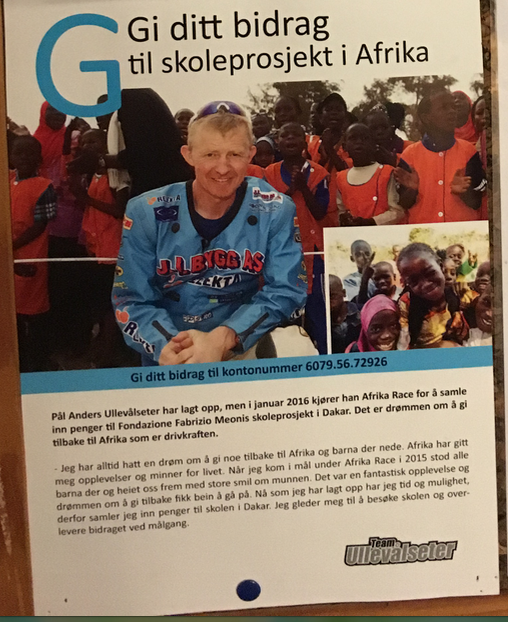 A poster advertises the charity race organized by Gerd’s son, Pål Anders Ullevålseter, a champion cross-country motorcyclist. I asked her about the numerous trophies that bedecked the beams, shelves, and pretty much every available surface of the café. “Those belong to my son; he’s a motocross champion who has competed worldwide in cross-country races for many years. He just got back from a charity race in Africa, but he’s close to fifty now and will be retiring this year, although he’ll keep teaching. He’ll also stay active with his cross-country skiing. And like his father, he’s a ski jumper.” Of course he is. Isn’t every Norwegian? I’m constantly astonished at how multi-skilled and athletic folks are here — and at every age. If only I’d been born Norwegian…. Check out the storybook charm of Ullevålseter’s interior, complete with motorcycling trophies stacked up along the rafters. Some of Pål Anders’s trophies are from the Africa Eco-Race. It’s a cross-country rally that covers more than 6,500 km (4,000 miles) over 11 stages in two weeks. The race crosses the territories of Morocco, Western Sahara, Mauritania, and Senegal. A moose stands guard over more trophies. Ullevålseter hosts a ski jumping weekend, with hotshot jumpers, trainers, music, and more. The image is of Otto Reider Ullevålseter taking his longest ski jump back in 1954. Feeling incredibly honored to have met this amazing lady and to have heard her great stories, I asked if I could take her picture. I think she thought I was a bit odd (yep, I was definitely starstruck), but she posed graciously for me, then wished us well as we headed out into the darkness for the long walk home. Can’t wait for another trip back to Ullevålseter. We hiked out into the darkness using our headlamps and the ski-trail floodlights to see our way home. What a wonderful story! Thank you for sharing it. I hope you and Matthew will have a wonderful time in Malta. It is a really unique place. All the best! Such interesting experience! Put your delicious descriptions into a book, please!